Nightmare is the fifth studio album by American heavy metal band Avenged Sevenfold. It was released on July 27, 2010 through Warner Bros. Records. It was produced by Mike Elizondo and mixed in New York City by noted engineer Andy Wallace. Nightmare is the first Avenged Sevenfold record without James "The Rev" Sullivan performing drums on all the songs due to his death in December 2009. However, he did write parts that were used for the final recordings, making this the last album he would write on, The Rev's vocals are still on the album as a tribute to him. This is the only album to feature ex-Dream Theater drummer Mike Portnoy, who performed as the drummer for the album in his place, also played with the band for all their tours through the end of 2010, due to his separation with Dream Theater. They then hired drummer Arin Ilejay, who played with the band for the next four years. The album has been certified Gold by the RIAA in the United States. The album debuted at number 1 in the Billboard 200. As of December 2016, the album has sold 964,000 copies in the United States. In late 2009, two years after Avenged Sevenfold released their self-titled album, and four years after they had issued their breakthrough studio set, 2005's City of Evil, the band started working on their next record, their "most personal and epic that will definitely take you on a very dark journey." However, as recording was in session, a few casualties arose. After a couple of months, more notices about the album became available; a short message from Zacky Vengeance was posted on the official Avenged Sevenfold Twitter on April 17, 2010: "Tracking is complete. There are no words that will ever describe the feeling of listening to this album while driving home alone at 4 am." The first single, "Nightmare", was released digitally on May 18, 2010. A preview for the song was released on May 6, 2010 on Amazon.com, but was removed soon after for unknown reasons; however, on May 10, 2010, a 30-second audio uncensored sample was again revealed, but this time at SoundCloud and on the band's official website. The band also posted, the same day, a video of the song on their official YouTube channel with animated lyrics, which received over 275,000 plays in 24 hours. Full Nightmare album on CD. Housed in a synthetic leather bound book with special silver-plated Nightmare crest. Limited 24″ x 36″ lithograph entitled Death Bat Anatomy, featuring original artwork on special textured paper embossed with a silver colored Death Bat. Instant download of the new single, Nightmare. Since May 27, 2010, the band revealed the album cover piece by piece like a jigsaw puzzle over a period of eighteen days, revealing the complete cover on June 14, 2010, along with the track listing. Bonus track: "Lost It All"
Behind the scenes footage from "Nightmare" music video shoot. Written treatment for "Nightmare" music video. Audio interview with album producer, Mike Elizondo. Type-set lyrics with hand-written notes for bonus track, "Lost It All". Sketches of album art concept. The song "Buried Alive" was posted on the band's Facebook page on July 14, 2010, but experienced loading issues due to a large number of users trying to access the video, and was briefly taken down. The problem was resolved on July 15, 2010, and was posted on YouTube as a lyric video which also contained a small animation. On July 21, 2010 the song "So Far Away" was released by KROQ radio exclusively for one day. On October 19, 2010, the single "Welcome to the Family" was released. On April 5, 2011, "So Far Away" was released, followed by the music video. In September 2011, the band announced plans for a music video for their next single, "Buried Alive". They tried to get Rob Zombie to direct the video, but he declined due to being focused on another project. Nightmare received generally positive reviews from music critics. At Metacritic, which assigns a normalized rating out of 100 to reviews from mainstream critics, the album received an average score of 62, based on 7 professional reviews, which indicates "generally favorable reviews". In the August 2010 issue of Metal Hammer, Terry Beezer rated the album an eight out of ten. In his review, he had praised the band members for their courage despite the death of The Rev and called it "the ultimate tribute to a fallen friend." He also praised Mike Portnoy for his part in the album and found him a fitting stand-in for The Rev. 411 Mania gave the record a lengthy but highly positive review by giving it a score of 9.0/10. As a conclusion they stated, "If you’re a fan of Avenged Sevenfold, Nightmare is a must-have for you. This album is incredibly moving and is better than any tribute to the late Rev I could have possibly imagined." Kerrang! gave the album 4 K's out of 5 concluding: "Where Avenged [Sevenfold] go from here is still in the lap of the gods. Whatever their future, though, Nightmare marks the point at which the Huntington Beach crew put away childish things and became men. Wherever he is now, their brother must be immensely proud." All songs credited to Avenged Sevenfold. Actual songwriters are listed below. The Rev – drum arrangement, backing vocals, drums and backing vocals on "Nightmare" demo and "Buried Alive" demo, lead vocals on "Buried Alive" demo, co-lead vocals on "Fiction", scream on "Save Me"
Brian Haner, Sr. – guitar solo on "Tonight the World Dies" and additional guitar on "So Far Away"
Sharlotte Gibson – backing vocals on "Victim"
Jessi Collins – backing vocals on "Fiction"
David Palmer – piano on "Nightmare", "Danger Line", "Fiction" and " Save Me", keyboards on "Danger Line" and "Save Me", B3 on "Tonight the World Dies" and "Fiction"
Stevie Blacke – Strings, string arrangement on "Nightmare", "Danger Line", "Buried Alive", "So Far Away", "Fiction" and "Save Me"
Stewart Cole – trumpet on "Danger Line"
The Whistler – whistling on "Danger Line"
Mike Elizondo – producer, keyboards on "Fiction"
^ a b c "Late AVENGED SEVENFOLD Drummer (Jimmy "The Rev" Sullivan) 'Appears' On Band's New Album". Blabbermouth.net. Roadrunner Records. May 14, 2010. Retrieved May 14, 2010. ^ Karan, Tim (May 17, 2010). "AVENGED SEVENFOLD ANNOUNCE TITLE, RELEASE DATE FOR ALBUM". Alternative Press. Retrieved May 18, 2010. ^ "Avenged Sevenfold vs. Warner Bros.: Inside the Potentially History-Making Legal Showdown". Retrieved July 12, 2017. ^ Harris, Chris (November 9, 2009). "Avenged Sevenfold Hard at Work on 'Epic' Next Record". Noisecreep. Retrieved May 16, 2010. ^ Harris, Chris (Jan 18, 2010). "Avenged Sevenfold Frontman Breaks Silence About Death of Drummer". Noisecreep. Retrieved May 16, 2010. ^ Harris, Chris (December 30, 2009). "Avenged Sevenfold Drummer James Sullivan's Autopsy Inconclusive". Noisecreep. Retrieved May 16, 2010. ^ a b "AVENGED SEVENFOLD To Release Nightmare Single This Month". Blabbermouth.net. Roadrunner Records. May 7, 2010. Retrieved May 12, 2010. ^ "Mike Portnoy To Drum For Avenged Sevenfold Throughout 2010". Metal Hammer. May 5, 2010. Retrieved May 13, 2010. ^ "Avenged Sevenfold New Album Recording Complete". Metal Hammer. April 19, 2010. Retrieved April 22, 2010. ^ "Avenged Sevenfold: The Rev's Passing Steered Album's Lyrical Direction | Interviews @". Ultimate-guitar.com. Retrieved 2011-09-20. ^ "Has The New Avenged Sevenfold Album Been Given A Title?". Metal Hammer. May 14, 2010. Retrieved May 14, 2010. ^ a b "Avenged Sevenfold Nightmare – Further Details Made Available!". Metal Hammer. May 7, 2010. Retrieved May 12, 2010. ^ a b "AVENGED SEVENFOLD: Nightmare Limited Edition Detailed". Blabbermouth.net. Roadrunner Records. June 6, 2010. Retrieved June 6, 2010. ^ "AVENGED SEVENFOLD Featuring DREAM THEATER Drummer; First Audio Sample Released". Blabbermouth.net. Roadrunner Records. May 10, 2010. Retrieved May 13, 2010. ^ "Avenged Sevenfold Nightmare Preview". Metal Hammer. May 11, 2010. Retrieved May 13, 2010. ^ "Avenged Sevenfold Limited-Edition Nightmare Package Revealed". Metal Hammer. June 4, 2010. Retrieved June 5, 2010. ^ "Pre-Order the Limited Edition of Avenged Sevenfold's New Album Nightmare". Warner Bros. Records. June 3, 2010. Retrieved June 8, 2010. ^ "Warn Everyone That the A7X Nightmare Is Coming". Avenged Sevenfold. Warner Bros. Records. May 27, 2010. Retrieved June 15, 2010. 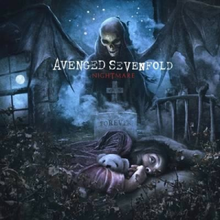 ^ a b "Avenged Sevenfold: Nightmare Artwork, Track Listing Unveiled". Blabbermouth.net. Roadrunner Records. June 15, 2010. Retrieved June 15, 2010. ^ a b Karan, Tim (June 15, 2010). "Avenged Sevenfold Reveal Nightmare Artwork, Track listing". Alternative Press. Retrieved June 15, 2010. ^ a b "AVENGED SEVENFOLD: Nightmare iTunes Edition Detailed". Blabbermouth.net. Roadrunner Records. June 30, 2010. Retrieved June 30, 2010. ^ a b "iTunes Pre-Order Available Now". Avenged Sevenfold. Warner Bros. Records. June 28, 2010. Retrieved June 29, 2010. ^ "Avenged Sevenfold: Official 'Buried Alive' Lyric Video Available". Blabbermouth.net. Roadrunner Records. July 15, 2010. Retrieved July 17, 2010. ^ "New Avenged Sevenfold album previews up online, and full length stream of new track". Lick Library. 21 July 2010. Archived from the original on 2 December 2011. Retrieved 2 December 2011. ^ a b "AVENGED SEVENFOLD Wanted ROB ZOMBIE To Direct 'Buried Alive' Video". Blabbermouth.net. 19 September 2011. Archived from the original on 2 December 2011. Retrieved 2 December 2011. ^ Robinson, Ian. "Avenged Sevenfold, "Nightmare"". Craveonline. Retrieved 2016-02-05. ^ "Nightmare". Metacritic. Retrieved August 27, 2013. ^ "Avenged Sevenfold - Nightmare review". Titan, Aaron. 2010-07-27. Retrieved 2010-07-29. ^ Lymangrover, Jason (2010-07-28). "Nightmare"" Overview". AllMusic. Retrieved 2010-07-29. ^ Pierce, Leonard (2012-07-27). "Nightmare - Avenged Sevenfold". The A.V. Club. Retrieved 2012-02-26. ^ "Kerrang! Kerrang! Magazine 28/07/2010". Kerrang!. 2010-07-27. Retrieved 2010-07-29. ^ "Metal Hammer". Metal Hammer. 2010-07-27. Retrieved 2010-07-29. ^ Lewis, Faye (2010-06-21). "AVENGED SEVENFOLD 'NIGHTMARE' - FIRST REVIEW". Rock Sound. Retrieved 2012-05-11. ^ Stagno, Mike (2010-07-26). "Nightmare - Avenged Sevenfold". Sputnikmusic. Retrieved 2012-02-26. ^ Mansfield, Brian (2010-07-27). "Avenged Sevenfold, Nightmare: More Than Metal". USA Today. Retrieved 2013-03-13. ^ "Nightmare Reviews, Ratings, Credits and More at Metacritic". Metacritic. Retrieved September 14, 2011. ^ "Metal Hammer | August 2010 | Inside | Zinio Digital Magazines". Gb.zinio.com. Retrieved 2011-09-20. ^ "Music - Avenged Sevenfold - Nightmare Review". 411mania.com. Retrieved 2011-09-20. ^ "ImageShack® - Online Photo and Video Hosting". Img191.imageshack.us. Retrieved 2011-09-20. ^ Revolver Magazine (December 7, 2011). "What Is the Song of the Year?". Revolver Magazine. Retrieved December 15, 2011. ^ "Australiancharts.com – Avenged Sevenfold – Nightmare". Hung Medien. Retrieved 2015-05-16. ^ "Austriancharts.at – Avenged Sevenfold – Nightmare" (in German). Hung Medien. Retrieved 2015-05-16. ^ "Ultratop.be – Avenged Sevenfold – Nightmare" (in Dutch). Hung Medien. Retrieved 2015-05-16. ^ "Ultratop.be – Avenged Sevenfold – Nightmare" (in French). Hung Medien. Retrieved 2015-05-16. ^ "Avenged Sevenfold Chart History (Canadian Albums)". Billboard. Retrieved 2015-05-16. ^ "Dutchcharts.nl – Avenged Sevenfold – Nightmare" (in Dutch). Hung Medien. Retrieved 2015-05-16. ^ "Avenged Sevenfold: Nightmare" (in Finnish). Musiikkituottajat – IFPI Finland. Retrieved 2015-05-16. ^ "Lescharts.com – Avenged Sevenfold – Nightmare". Hung Medien. Retrieved 2015-05-16. ^ "Longplay-Chartverfolgung at Musicline" (in German). Musicline.de. Phononet GmbH. Retrieved 2015-05-16. ^ "Italiancharts.com – Avenged Sevenfold – Nightmare". Hung Medien. Retrieved 2015-05-16. ^ "Oricon Top 50 Albums: 2010-08-09" (in Japanese). Oricon. Retrieved 2015-05-16. ^ "Charts.org.nz – Avenged Sevenfold – Nightmare". Hung Medien. Retrieved 2015-05-16. ^ "Norwegiancharts.com – Avenged Sevenfold – Nightmare". Hung Medien. Retrieved 2015-05-16. ^ "Swisscharts.com – Avenged Sevenfold – Nightmare". Hung Medien. Retrieved 2015-05-16. ^ "Swedishcharts.com – Avenged Sevenfold – Nightmare". Hung Medien. Retrieved 2015-05-16. ^ "Spanishcharts.com – Avenged Sevenfold – Nightmare". Hung Medien. Retrieved 2015-05-16. ^ "Avenged Sevenfold | Artist | Official Charts". UK Albums Chart. Retrieved 2015-05-16. ^ "Avenged Sevenfold Chart History (Billboard 200)". Billboard. Retrieved 2015-05-16. ^ "Canadian album certifications – Avenged Sevenfold – Nightmare". Music Canada. Retrieved June 23, 2017. ^ "British album certifications – Avenged Sevenfold – Nightmare". British Phonographic Industry. Retrieved June 23, 2017. Select albums in the Format field. Select Gold in the Certification field. Type Nightmare in the "Search BPI Awards" field and then press Enter. ^ "American album certifications – Avenged Sevenfold – Nightmare". Recording Industry Association of America. Retrieved June 23, 2017. If necessary, click Advanced, then click Format, then select Album, then click SEARCH. This page was last edited on 8 March 2019, at 00:13 (UTC).